"There' s something nice to be made of it." – "How do you get it warm in winter?" These were the two sentences we have heard most frequently from visitors in the early days. Visitors? Without knocking, they stood there, in the middle of the room, someone who was passing by and wanted to discover something - just like us. Us? 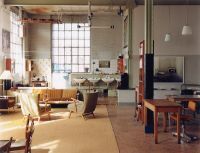 Since April 1994 the Meisterzimmer 1 was the studio of a few Spinnerei pioneers. Peter Bux, Daniel Milonic, me, and then from 1995 Ricarda Roggan. All young artists from some art college - drawn out to discover the world and to make it happy or frighten with their art. And here in the Spinnerei we had the opportunity to try out everything and ourselves. 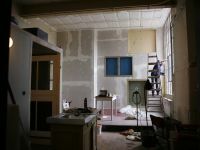 We could use the rooms as we wanted: to draw, paint, build, spin and be free. Thanks to Regina Lenk, who, as the manager of the Spinnerei, gave us a bundle of keys and let us discovered the world and our world was the Spinnerei. 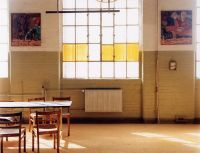 In 2002 the production, like all other original works in the Spinnerei, was discontinued. It was, in any case, only a requirement of the Treuhand to take over a few employees of the former 3,500 workers, most of whom were women. "Meisterzimmer" were, incidentally, the glass-fronted workshops of the Spinnerei work masters. Around the 2000s there was quite a lot happening, also in the Spinnerei. More and more artists were drawn, there were numerous workshops, a café, Jim Whiting's legendary Bimbo Town and a lot of people who had attracted the whole creative environment. It was becoming chic. Especially when the galleries came out of the city. And our keybund we had for a long time no longer, only one or the other door still went up. We were good tenants, almost. In the studio we have always built a lot. So the space has grown, but without losing its character as a former ladies' attire (we renewed the washbasin row with original parts in 2016). From 2001 I was alone in the room, I built the garden hut in 2006 and moved to Jena in 2008. 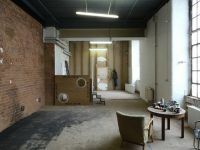 In order not to have to give up the room completely, we came up with the idea of ​​renting it to Leipzig guests from time to time. Because we had often noticed that the accommodation in our area was rather modest. It was not a business idea in the real sense, we had not invested and did not expect any profits. The room was initially spartan furnished, the toilet still in the corridor, the sheets of relatives and the warm water in the shower needed (only) 3 minutes. But the price was also very low and the space huge. This has pleased the guests, more than we had expected. 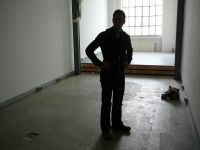 And when the press began to report, I rarely had the opportunity to use the studio myself. So we have gradually expanded the room and improved the equipment. In 2011 we build the second, 2013 the third and 2014 the fourth room. Now a good measure has been reached, and I hope that the idea - to convey something of the sense of freedom that the space and the Spinnerei has always radiated on us - remains recognizable. We built many things ourselves, and let many a special things build. 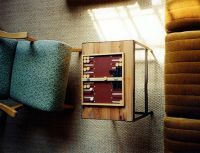 Jana Gunstheimer, who can make a virtue out of every need, was part of the project, especially in design and furnishing. I have always enjoyed building, paralel I also build digital - websites. So some things have come together, which makes it possible to run a "pension" - fun at building and trying out, enjoy having guests and, of course, also some luck. Meisterzimmer - what are we doing there?